Scientific Names: Order Hymenoptera, family Vespidae, Polistes spp. Identification: Yellow and black wasps that are usually called yellowjackets. When wings are at rest, they are folded and held out to the side rather than folded over the back like other wasps. Nests are papery, slightly rounded, 4 inches or greater in diameter; they hang upside down. Biology and Life Cycle: Social insects living with queens, males, and sterile female workers. Overwintered and mated females start nests in the spring in a sheltered place. Cells of a paperlike substance are built from a single connection to a structure or plant in a shady location. Several females may work together. One egg is laid in each cell. 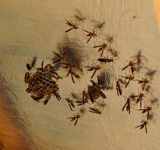 Larvae hatch and are fed chewed-up insects and spiders. When ready to pupate, they spin silk caps to close off the cells. Queens lay fertilized eggs that become females. Fertilized female larvae (new queens) are fed a special diet and are the only ones to survive the winter. They are the last batch of females to hatch in the fall. All others, males and females, die. Surviving queens hibernate in dense foliage such as dead palm leaves or in rubbish or old squirrel nests. Habitat: Sheltered spots under the eaves and overhangs of buildings. Also in barns, chicken houses, and other outbuildings. Adults feed on flower nectar or fruit that has been bird-pecked. Feeding Habits: Wasp larvae are carnivorous and are fed moth and butterfly larvae that are chewed up by the adult wasp workers. Economic Importance: Control of several troublesome caterpillars of moths and butterflies. Natural Control: Spiders. Splash water on nest to knock wasps off, then move nest to higher but similar location in the shade. Don't try this if you're allergic to wasp stings or if you are chicken! Organic Control: Soapy water or citrus oil products if the nest is in a problem area. Do this only as a last resort - these insects are very beneficial. Insight: Texas yellowjackets are similar but live in nests in the ground and are more aggressive. The wasp's most serious enemies are humans with aerosol spray cans. In the roof overhang on the shed is a family of paper wasps. The paper wasps are building 2 nests outside and one inside and there is already about 4-6 dozen of them. In your Book the Organic Manual suggested spraying them with water and relocating the nest. These little warriors did not go very far and I did not have enough time (maybe courage) to relocate the nest with them flying around everywhere. I do not mind them around my "HG way Organic Garden", but I am scared the wasps have too large of a population above the shed door.